Luna Tsukigami (aka Lunatic Joker) is a Japanese illustrator and manga artist whose works have been featured in a variety of magazines and publications. His live drawing sessions are always crowdpleasers at events he attends. He is a regular contributor in the drawing tutorial corner, "CA Studio" in Kadokawa Comp Ace magazine. 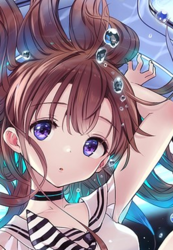 He has done illustration work for the light novels series "Kuzubako no Houkiboshi," "Omae nanzo ni Musume ha Yaren," "Zakogami-sama," and "Audition!" Funded by Kickstarter, his 2013 work, "Moe Headphone Design Guidebook" was translated and released recently by Sekai Project. He's quite a fan of Red Bull.